Ok so it’s supposed to be spring. The sun is out but it’s just not that warm yet. Part of me wants to dispense with the winter dishes as I crave fresh light summery salads, but my body stills yearns for a warming and comforting dinner. I am a creature of habit and I like a nice roast dinner in the Autumn and Winter and maybe a barbecue and salad in the spring and summer, but that is just not happening yet. Apart from a few hardy friends who have braved the chill I’m not quite ready to brave al fresco dining. This Sunday was just such a day. The sun was shining but a chilly wind blew. I wanted to eat light, but I had all the ingredients for a roast and it was that for which I yearned. But I couldn’t go the whole hog so instead I decided to go half and half with a salad that was both spring like, but also most importantly, hot. I used the last of the purple sprouting broccoli from the garden which I combined with early Jersey Royals, red onions and peppers. It was perfect. Served with a rare pan braised fillet of beef and mini yorkshire puddings. Best of both worlds I’d say. Wash the potatoes and put in a roasting tin. Pour over a good glug of olive oil, some salt and pepper. Toss well and roast in a hot oven gas mark 7/200 degrees C.
Finely slice the onion and pepper. Wash and trim the broccoli. After 45 minutes of the potatoes roasting heat some more oil in a pan. Toss in the onion and peppers and cloves of garlic which have been lightly crushed with the blade of a knife. Fry gently until starting to soften. Add the broccoli and fry for another five minutes or so depending how thick it is. My broccoli was the last from the plant and was quite thin stalked. 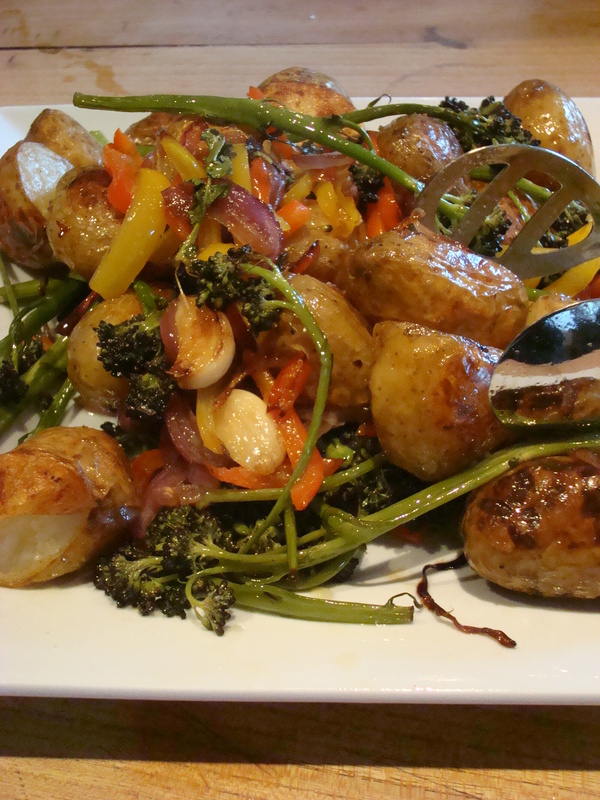 When they are all half-cooked take the roasted new potatoes out of the oven and throw in the vegetables. Return to the hot oven for about 6 to 10 minutes. Tip everything on to a serving plate and dress simply with some salt and pepper and a squeeze of lemon juice. Trust me it ticks all the boxes.